Club legend Alan Knight is the new ambassador for Portsmouth FC’s community health project. 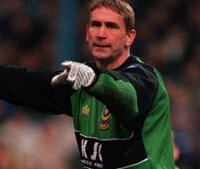 Knight, who was made an MBE in 2001, holds the record for the most appearances for a single club by a goalkeeper beating Chelsea’s Peter Bonetti. He made 801 appearances during his 23 years with the Blues but since retirement has battled with booze and bankruptcy. The turning point for him came when he asked for help. Now he hopes to encourage other men to do the same. There appeared to be nobody to turn to but ‘as a former footballer I was very lucky to be able to attend the Sporting Chance clinic, which was founded by Tony Adams'. Adams is the former Arsenal and England defender who has had his own problems with alcohol and drugs. Knight says: ‘In the end I had somewhere to go, but it was a big step for me to go and seek help because of my pride. ‘Anything I can now do to help, I will. If I can raise the profile of the programme a little and help someone who finds themselves in those dark places, so much the better. ‘Some might find it strange that someone who drank and still smokes is attempting to help others – but who better than someone who knows what they’re going through? Paul Allen, the health trainer who invited Knight to be the club’s ambassodor said: ‘I approached Alan a couple of months ago with a view to getting involved. More and more football clubs are realsing the impact they can have on the health of their supporters with health promotion programmes. Portsmouth work closely with Centrepoint, a local homeless centre offering a hot meal and shower, as well as help with housing, benefits and drink and drug matters.